One of the best places to start your adventure in Taiwan is at the waterfalls of Sandiaoling. Taiwan’s hot springs are said to have magical healing minerals that, among many things, can improve your complexion and ease your arthritis. Feel like eating squid on a stick while a man wheels a carriage of cats around and charges people to cuddle them? Then just head to a Taiwanese night market! Taiwan is home to 14 different aboriginal tribes. The Amis, who are spread across Taiwan’s mountains and eastern coastal areas, is the largest. Need a refresher after a day of trekking? Pick any one of Taiwan’s oceanic shorelines! "Taiwan’s temples immediately struck me as open and breezy with their big, inviting courtyards." 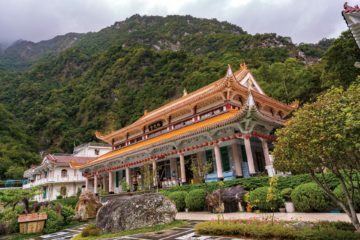 Taroko, Kenting and Yangmingshan are vastly different parks in Taiwan that say a lot about the island's incredible diversity. Taipei 101 is designed to resemble a stalk of bamboo. Here are 7 other top attractions in one of Asia's most bedazzling cities! From buzzing Taipei to Hiaosi's famed hot springs, spectacular Taroko National Park and Chihshang, where you can bike or stroll in the lush East Rift Valley. Taiwan is really, really photogenic.